Styled with brantly tank and adelio blazer . Tailored with matte satin, these polished grazers play up this season's pajama dressing aesthetic. Precise seamwork and flattering darts create a feminine silhouette that's ideal for rising temperatures. 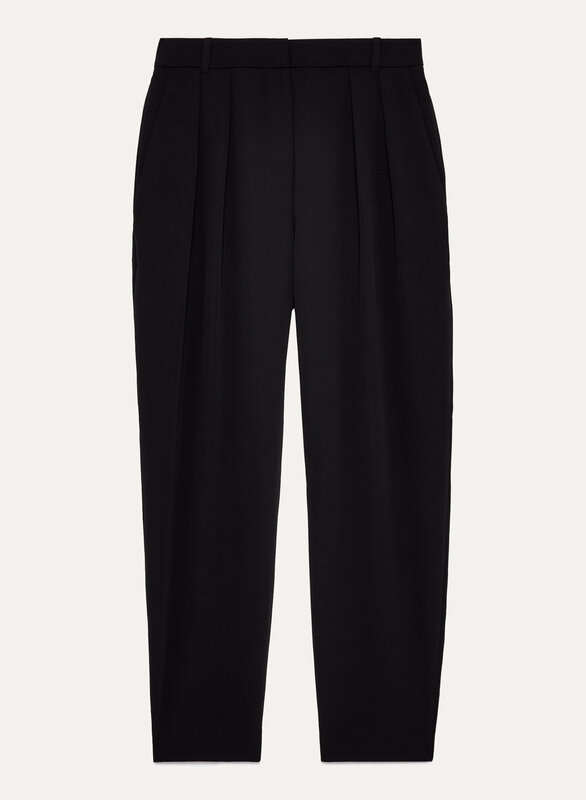 These trousers are a great piece to have in your closet. I love the high waisted fit, they're not tight and are super flattering. I like pairing them with a t-shirt or sweater, jean jacket and sneakers for a casual look or a cropped top, leather jacket and heels for a dressy night look. They're also perfect office pants. I have them in 2 colours already and want them in black! I really wanted to love this pant, but I was unfortunely dissapointed in the material as well as the fit. I have the black pair and I love the satin finish however my issue is how quickly static builds up on these pants. I find them clinging to my body. I have tried dryer sheets which work initially but then throughout the day they still cling. I will also try static guard. Also I find that anything sticks to these pants. The fit is fantastic and comfortable to wear.